UPDATE #5: I (J.T.) will be unable to attend this event as I’m hosting another event for one of my other groups, however my excellent Assistant Organizer, George, will be there on my behalf. He will see you there! UPDATE #4: Just a reminder, I’ll be the one with a red flag (1 foot x 1 foot in size), with the word “ACK” on it, at the downstairs lobby at 7pm! Once I check you in, I will give you your tickets. Please be ON TIME. Don’t forget to account for Metro, traffic, and parking delays. See you there! UPDATE #3: I was able secure for us an additional 8 tickets together about 10 rows back (on the right side as you’re facing the stage) from our initial front row (or close to front row) batch of tickets. These are still great seats, and as a matter of fact, some people prefer these seats to our front row spots. Any RSVP on Tues. Feb. 6th or later will be in these seats. UPDATE #2: The early-bird price has ended and the ticket price is now $52. I look forward to seeing you there! UPDATE #1: There are fewer than 10 early bird spots left and the price will increase from $45 to $52 when the early bird spots are gone or by Sun. Feb. 10th (whichever comes first). To be fair to those who want to join in and are ready to make payment, I’ll be removing those that haven’t paid by Sun. Feb. 4th. Make payment to lock in the early bird price and your spot (see the “Payment” section of the event posting). If you’ve already made payment, the PayPal email you received is confirmation that we’ve received your payment (no need to message me asking for ticket confirmation). This UPDATE has been emailed to the yes RSVPs. I hope to see you there! 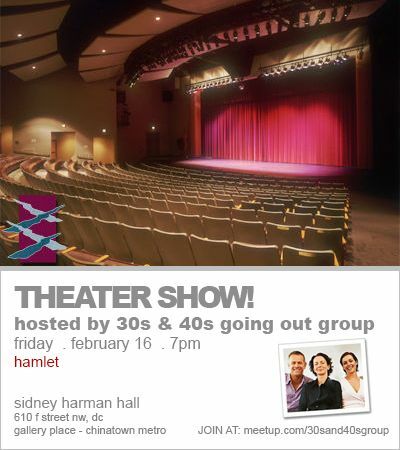 We’ll meet at the downstairs lobby for check in, and then get together for a drink or two at the 2nd floor Sidney Harman Hall bar before the show, and then go see Hamlet. In the wake of his father’s abrupt death, Hamlet returns home from university to find his personal and political world changed as he never imagined it could—his mother remarried, his uncle on the throne and a world seemingly gone insane. When his father’s ghost appears and demands vengeance, the increasingly desperate Danish prince must decide: submit or resist. Accept or avenge. Live or die. Michael Urie (Buyer & Cellar, Ugly Betty) stars as Hamlet under the illustrious direction of Michael Kahn. Together, they’ll give life to the greatest character of Western literature as he confronts the line between madness and inspiration. I scored for us front row (or close to front row) seats! Our front row tickets are ordinarily priced at $113 (fees and taxes included) We’ve got an early bird special for this event of only $45! The first 20 paid sign-ups, or those who pay by Sun. Feb.11th (whichever comes first) get the early bird price! After that, the ticket price will go to $52. We have a LIMITED number of spots so make sure to RSVP early AND make payment to secure your spot and get the early bird price! To make payment, please follow the steps in the “Payment” section of the event posting.